Augsburg - may have only made 34 Bundesliga appearances so far, but the 20-year-old left-back is already considered one of the hottest prospects in European football after a series of commanding displays for surprise package FC Augsburg this season. In an exclusive interview with bundesliga.com, the Ghanaian international discusses the secret to his club's success in 2014/15, this weekend's match at home to Bundesliga leaders FC Bayern München and adjusting to life in Germany. Abdul Rahman Baba: Yes, that's right. The atmosphere both on and off the pitch is great, you notice it in every training session and in every game. But we have to keep working hard to make sure we maintain our level, everyone has to give their best every day of the week. bundesliga.com: What have Augsburg got in them this term? Baba: Obviously we want to win as many games as possible, but we all know how quickly it can go the other way. In Bayern, Hannover and Mönchengladbach we've got three really tough games before the winter break, so we've got to call on everything we've got. Baba: He's certainly a fantastic player who's been in unbelievable form for two or three years. It's hard to shut him off completely, but I know his game and will be well-prepared. bundesliga.com: Who's the toughest player you've come up against so far in your career? Baba: You face top players every week in the Bundesliga. We've already played against the likes of Dortmund's [Marco] , [Pierre-Emerick] and [Henrikh] , as well as Leverkusen's [Heung-Min] and [Karim] this term to name a few. They're all really, really good players. bundesliga.com: You've had a big say in Augsburg's success yourself, putting in more crosses than anyone else - three of which led to goals. How would you characterise your game? Baba: Offensive, I think - I like to try any get forward as often as possible. Of course, it's all the better if a cross leads to a goal, but you have to work on these things every week in training, fire in cross after cross. bundesliga.com: Interestingly, prior to the current campaign you'd only registered one assist in 42 games in Germany. Have you noticed that you've made a big step in terms of your own development? Baba: We try to play down the flanks a lot at Augsburg which I wasn't really used to. I've already learnt a lot about how to do that during my time here and want to get better step by step. I'm delighted it's been going so well so far. Baba: Hans Sarpei is really well-known in Ghana because in his time not many of us had played abroad. My style of play is a bit different, though, probably more attacking - everyone has their own way of doing things. bundesliga.com: Maybe you'd be even better if you played further forward? What's your favourite position? Baba: I'm happiest on the left-hand side, regardless of whether it's in an attacking or defensive role. You have to be good in attack, but also able to defend well. That's the most important thing. bundesliga.com: Did you speak to any of the Bundesliga's Ghanaian players - past or present - before you changed clubs? Baba: Of course you speak with your compatriots about the Bundesliga and other clubs, but I didn't really ask for advice. In the end it's up to you to make the right decisions. bundesliga.com: What tipped the balance in Augsburg's favour then? Several clubs were believed to be interested in you last summer, and even before your move to Fürth in 2012. 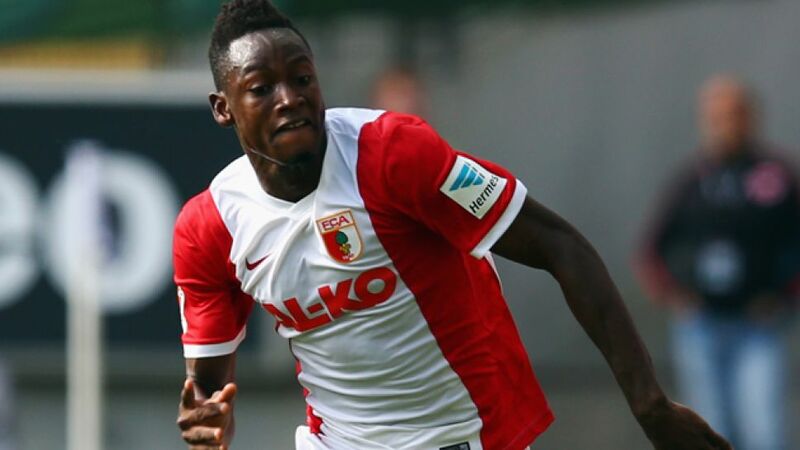 Baba: Augsburg put a lot of effort into signing me and really wanted me which I appreciated. We have a good team, a good coach and a fantastic atmosphere at the games. It's clear judging by the last few years that young players are able to develop here. Coming here was definitely the right decision. bundesliga.com: How would you summarise your first few months at Augsburg? Click here to find your local broadcaster for Augsburg's match at home to FC Bayern München on Saturday. bundesliga.com: What kind of reception do you get when you go back home? Are you regarded as a huge star? Baba: No, I don't see myself as a big star. I've only just turned 20 and there are plenty of footballers in Ghana who have enjoyed huge success, both domestically and internationally. bundesliga.com: What do people in Ghana make of the Bundesliga? Baba: They think very highly of it. After all, it's the league of the world champions. My compatriots have great respect for German players and really admire them. bundesliga.com: You're due to play for Ghana at the African Cup of Nations this winter. What are your aims going into the tournament? Baba: The Africa Cup of Nations is a big tournament. We played well in qualifying, so we want to get as far as possible. I hope I'll be able to help the team in achieving those aims. bundesliga.com: National team head coach Avram Grant has hinted that Schalke star could make his comeback for the side. Would you like to see him return? Baba: Any team would like to have a player with the quality and charisma of Boateng, but our coach will have his own opinion. He'll make the right decision.